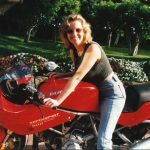 We own, or have owned, the classic motorcycles on these pages — occasionally trading them for a different model, a different make, a different motorcycle. They range in age from the 1930s to 1970. 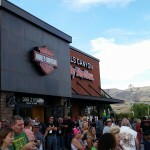 Most of the motorcycles were restored, renovated or simply rejuvenated by Ziggy. 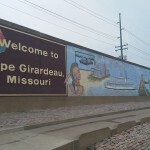 We hope you enjoy the pictures and information. 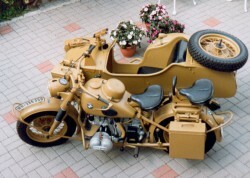 This military BMW and sidecar is museum-quality restored in the Afrika-Korps desert tan color. It has a 4-speed gearbox with a reverse gear. We also have the MG 34 machine gun that mounts on the sidecar. 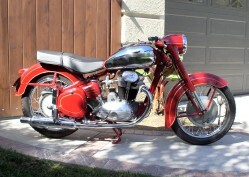 This bike is from the Czechoslovakia. It has a bevel gear drive overhead camshaft and large drum brakes. The 500cc version is rare. 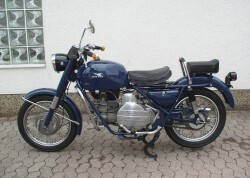 This Konsul is a 500cc single cylinder 4-stroke machine. 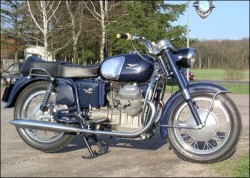 The Konsul II was the final development of NSU’s big single-cylinder motorcycles. This beautiful bike was built in Varese after the former aircraft company received a cash infusion from Harley Davidson. 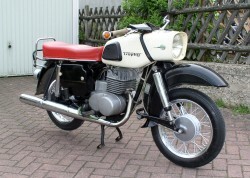 It has an air-cooled OHV single cylinder engine. 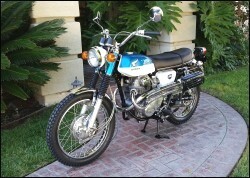 The CL350 Scrambler has a 4-stroke OHC vertical twin with a 5-speed transmission. 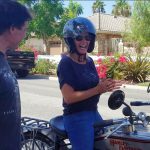 This is Lisa’s latest ride. Great bike — a head turner. This is a 150cc two-stroke, single cylinder, air cooled scooter. 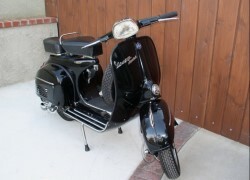 A cool Vespa classic in great condition. 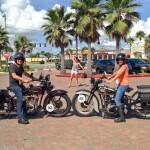 The CL350 Scrambler in orange / white was the matching bike to Lisa’s Scrambler. We bought it for our son, but he wanted something faster. This Gold Star with the Clubman trim is one of Ziggy’s favorites. 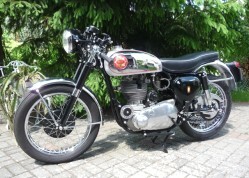 It’s a classic English bike with a beautiful chrome tank. This is a 700cc Italian ex-police motorcycle. 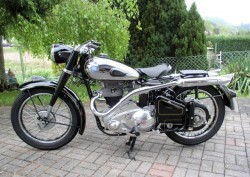 It was one of the first models that had the 90° V twin engine, designed by Giulio Cesare Carcano. 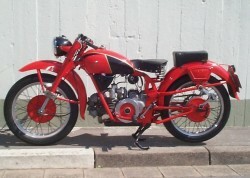 This was one of the last motorcycles designed by Carlo Guzzi himself. We’ve had two Lodolas. 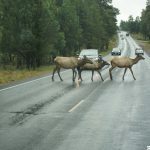 Click on the image to see them. 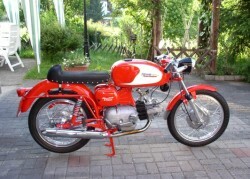 The 250 Airone was the most popular medium-sized motorcycle in Italy for 15 years. Notice the exposed flywheel, known as the “salami slicer”. 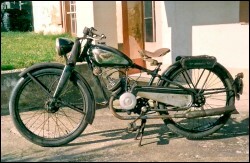 This Falcone was a redesign of the Falcone with a flat single cylinder engine. It was used by every police department in Italy. 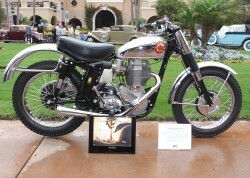 A show winner — most recently it took 1st place at the Dana Point Concours in 2013. It has the rare 1-1/2″ Amal GP carburetor. This scooter wasn’t restored, but was clean and original. 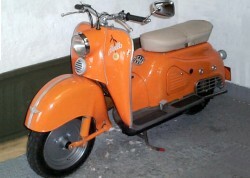 Zündapp built nearly 130,000 scooters between 1953 and 1964. What a beauty. 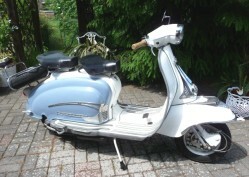 This 1961 Lambretta is a 125cc with wonderful 50’s colors. Nice two-seater with a throttle shift. The Nimbus is an oddly-cool looking bike out of Denmark. It has a four-cylinder, in-line engine, three speeds and shaft drive. Not as nice as the Gold Stars, but a handsome machine. 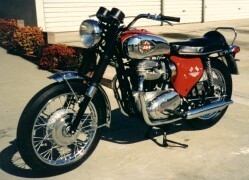 Ziggy bought this bike in original condition and restored it in six weeks. This is a rare bird. We sold this 20 years ago in California, and it ended up back in England. 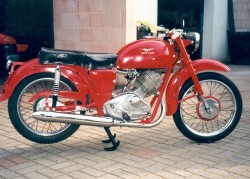 It has a twin cylinder 850cc Commando engine. 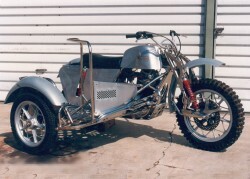 The sidecar frame was built by the Wasp factory. 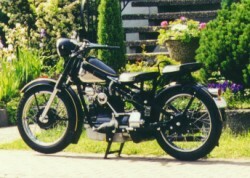 MZ stands for Motorradwerk Zschopau, located in former East Germany. 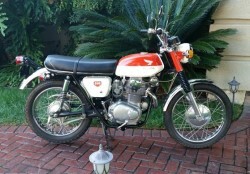 It is a 250cc, air cooled, single two stroke. We love the Art Deco tank/headlight combination, nicknamed the “TV lamp”. We had a few of these “barn finds” over the years while living in Germany. They were built by one of the oldest manufacturers, the Wanderer-Werke, A.G. out of Chemnitz.